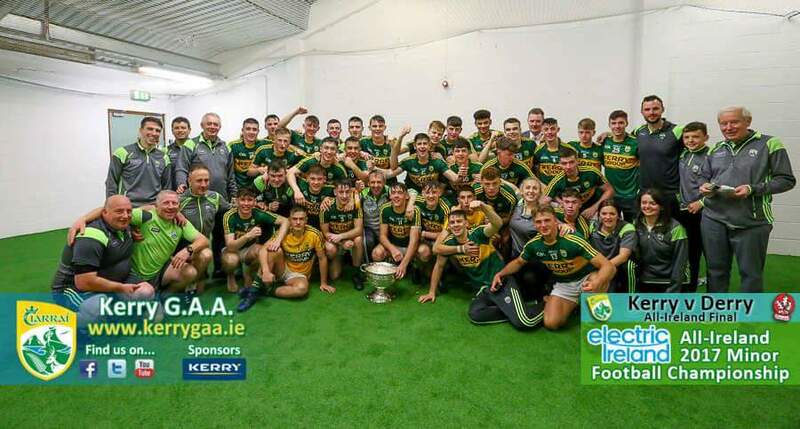 The irresistible David Clifford inspired Kerry to a comfortable win over Derry in today’s Electric Ireland All-Ireland Minor Football Final. Clifford scored an incredible 4-4 from play, and there was a touch of class to every score. His ability to create space for himself with dummy solos before finishing clincially was a joy to watch, and totally befuddled a Derry defence that, try as they might, couldn’t really land a glove on the Fossa teenager. There can be no doubt Clifford will become a star in the senior game, he’s just too good not to make the grade. It didn’t take him long to leave his stamp on this game, just 12 seconds to be precise. Right form the throw-in Kerry stormed downfield, and when the ball made its way to Clifford he jinked inside onto his left foot and guided a lovely finish to the bottom left-hand corner of the net. Derry’s reaction to this early set-back was impressive as big midfielder Oisin McWilliams flighted over a fine-point. And when they hit three more points in a row from Mark McGrogan and Lorcan McWilliams (2), there was just a point between the teams, 1-2 to 0-4. But with Clifford in the driving seat, Kerry then put their foot on the gas to zoom off into the distance leaving Derry choking in their dust. Clifford scored his second goal and then set up his name-sake, Fiachra Clifford, for Kerry’s third with an outrageous cross-field defence splitting pass. By the 25th minute Kerry had moved 3-7 to 0-4 ahead having scored an unanswered salvo of 2-5, and the match was effectively over as a contest. Derry kept plugging away and scored a goal of their own in the second-half when impressive substitute Callum Brown scored a penalty that Patrick Quigg converted, but it was still mainly one-way traffic. Clifford struck for two more goals in the space of a couple of minutes to push Kerry 6-10 to 1-7 ahead, and from there they free-wheeled all the way to the final whistle. That’s four All-Ireland minor titles in a row now for the Kingdom, a serious achievement and a testament to the great work being done in the county at schools and underage level.